Welcome to SCUBA News. I hope you find it useful. Any questions or comments email news@scubatravel.co.uk. Quiet diving in the Caribbean, in the Pacific and in volcanic lakes. Lots to choose from in Nicaragua. Great visibility and plenty of wrecks - try Greek island diving in the Med. The Seychelles are protecting 210,000 square kilometres of ocean and welcoming scuba divers. 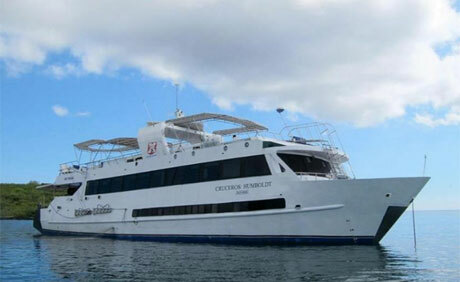 visiting Galapagos Central Archipelago, Darwin And Wolf Islands. New research shows that a fifth of the world's biggest fisheries depend upon healthy seagrass meadows. The meadows are also extremely important for small-scale fisheries. Seagrasses are marine flowering plants that form extensive meadows in shallow seas on all continents except Antarctica. A new study, by scientists at Cardiff and Stockholm Universities, concludes that seagrasses should be recognised and managed to maintain and maximise their role in global fisheries production. In the Mediterranean, for example, seagrass covers less than 2% of the sea floor, but seagrass-associated fish and invertebrate species comprise 30%-40% of the total value of commercial fisheries landings. One of the author's of the study, Dr Leanne Cullen-Unsworth, says: "Seagrass meadows support global fisheries productivity by providing nursery habitat for commercial fish stocks such as tiger prawns, conch, Atlantic cod and white spotted spinefoot". There is now an app for mapping Seagrass. You can become a citizen scientist and contribute to marine conservation with just a few taps of your phone. Get along to Seagrass Spotter and make your contribution. Posidonia in Peril: Save the Seagrass Meadows, Gaye Rosier, SCUBA News. Coral reefs in the north Red Sea are resilient to climate change and acidification, but excess nutrients from sewage, fish farms and flash floods can finish them off. The bot is an important step toward a future when soft robots can swim in the ocean alongside fish and invertebrates without disturbing or harming them. Oldest diver in the world is 94! Navy veteran Ray Woolley has been awarded the record of the world's oldest diver. Last year, at the age of 93, Ray did 51 dives. To mark his 94th birthday he made a 38-metre dive to a sunken ferry. In the warm seas of the Mediterranean lives a jellyfish with an extraordinarily rare ability - it can rewind its life cycle. Global shark fisheries have for decades engaged in the deliberate catch of dolphins, seals and other marine mammals to use as bait for sharks, a new study has found. Gulf of Mexico deep-sea corals have won protections today in a first-of-its-kind plan to safeguard some of the region's coral hot spots and restrict damaging fishing gear in most of those areas. Rising water temperature, changing salinity and oxygen levels, and human activity, are all adding to the strain on sea life, with the report claiming that 35 per cent of the fauna found in the Arabian Gulf in 2010 will become extinct over the next 62 years. Around 1.4 billion pounds of garbage is dumped into the ocean every year, which along with other sources of pollution, including sewage, industrial waste, and oil spills, kills over a million seabirds and 100,000 sea mammals every year.